Once you make a decision to secure your apartment, house or office, you will face a choice: to use a professional security system or trust a more affordable non-certified alarm system. Without submerging into the nuances, it seems that the differences are insignificant and any security equipment will be able to cope with the task successfully. But the desire to save leads to a lot of problems. The detectors are prone to false alarms or failure to respond to real threats. They may stop functioning suddenly and the system will not warn you of the malfunction. Radio communication range is barely enough to cover the premises and the connection is constantly interrupted. The app fails to work properly. Your facility (e. g. your property and even the lives of people) is left completely unprotected from attack by intruders. In addition, security companies refuse to link the alarm system to the monitoring station, and responses to alarms fall on your shoulders. In order to help you make the right decision, we have formulated 6 main requirements for a reliable security system. Furthermore, we have also outlined how exactly Ajax corresponds to this requirements. The security system can use various communication channels for the transmission of alarms to the user and the security company: GSM, Ethernet, and Wi-Fi. Alarm systems equipped with a single communication channel are unreliable as the latter can stop functioning due to natural causes and the system will fail to communicate the alarm to the user and the security company. For example, if you run out of balance on your SIM card account or because of a failure on the provider’s side. Furthermore, such alarm systems are easier to sabotage: simple jamming of GSM frequencies (if a SIM card is used alone) or cutting of the Ethernet cable (if you use only wired Internet connection). If a security system has several communication channels, one of them is used as the main channel while the others represent backup ones. Such systems are more reliable since a simultaneous failure of several channels is less likely to occur, and in the event of a natural failure, the system will continue to function normally. The more communication channels the system uses, the higher the chance of informing the user and the security organization of the threat in a timely manner. The channels must be of different types. If several GSM-modules are installed in the control panel and no other communication channels are used, then in reality you only have a one channel. If GSM frequencies are jammed, the system will be cut off from the outside world. It also matters how long it takes to switch between communication channels. With cheap alarm systems, the process can take dozens of minutes. Meanwhile, an apartment robbery rarely lasts more than 5-10 minutes. Hub uses GSM and Ethernet to communicate events and alarms, and Hub Plus is unique among the security system control panels as it uses four authorized communication channels at the same time: Wi-Fi, Ethernet, and two 2G/3G SIM-card slots. 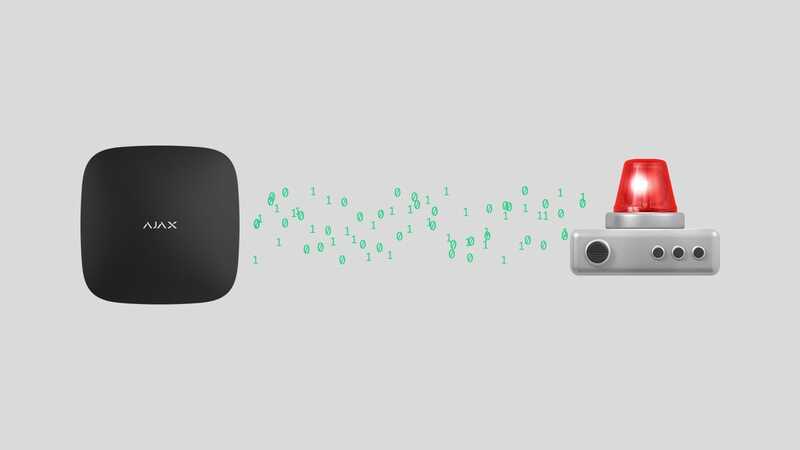 Switching from Ethernet (or Wi-Fi for Hub Plus) to SIM card occurs instantly while switching between Hub Plus SIM-cards requires up to 4 minutes. As a rule, the cloud server represents a link between the control panel and the security system management application. It enables the user to control all aspects of the equipment functioning via the Internet even if the user is located a thousand kilometers away from the facility. In addition, the server sends informative push notifications about system events and alarms. 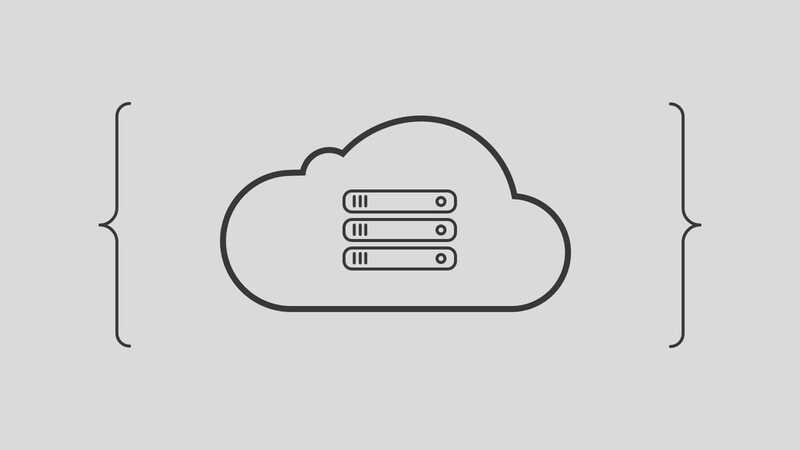 In professional systems, cloud servers also monitor the connection with the security equipment and its functionality by polling the control panel. The higher the polling frequency is, the faster the server will detect the presence of a problem and will warn the users and the security company of the situation. 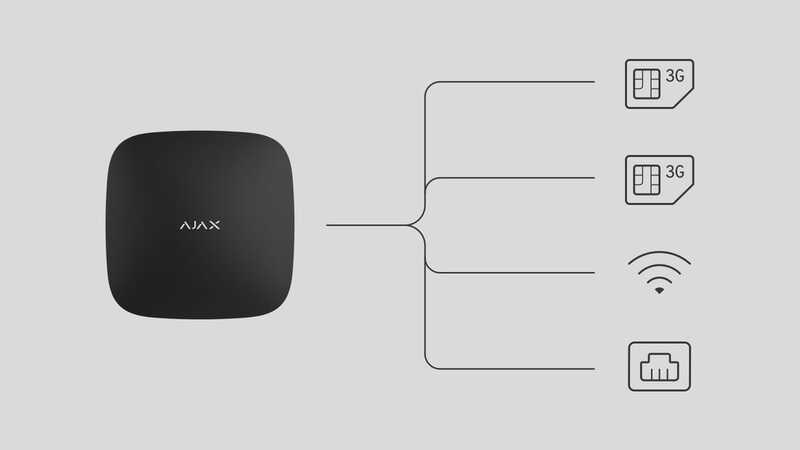 In addition to the ability to control hubs through the applications and receive push notifications, the Ajax Cloud service is responsible for displaying current security system data. The service regularly (from 10 to 300 seconds, depending on the settings) communicates with the hub and updates the device statuses in the Ajax applications. 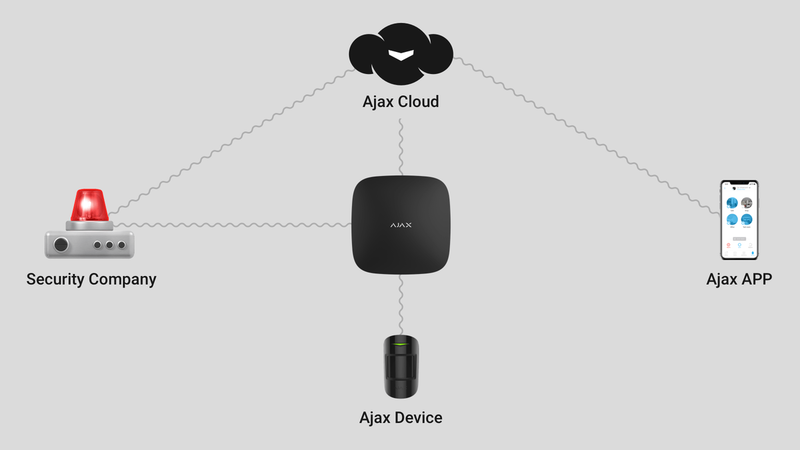 If the hub disconnects, the Ajax Cloud service sends an alarm to the users and the security company. In wireless security systems, the exchange of information between the control panel and the detectors occurs via the radio channel. The communication should be extremely reliable as even short-term disruptions are undesirable (they lead to an increase in the time period required for communicating an alarm) while the loss of communication is completely unacceptable (control panel, and consequently the users and the security company will not be aware of the alarm). As a rule, professional systems operate at frequencies of 433 MHz or 868 MHz and use a frequency band rather than a single fixed frequency for communication between the control panel and the detectors. This enables the system to change the operating frequency automatically in case of accidental or intentional interference. The technology is known as frequency hopping. In apartment buildings and offices, Wi-Fi frequencies (2.4 GHz and 5 GHz) are very noise-contaminated and are also overloaded with devices: computers, smartphones, and home appliances. This leads to “domestic jamming”, i. e. data loss during transmission. If the network equipment of the facility (routers, repeaters) is involved in the data transmission over Wi-Fi, the stability of its operation determines the operability of the security system. Wi-Fi has a relatively small communication range amounting to approximately 150 meters without obstacles. The restriction is eliminated through the deployment of a multi-component network at the facility, but each new unit reduces the reliability of the security system. 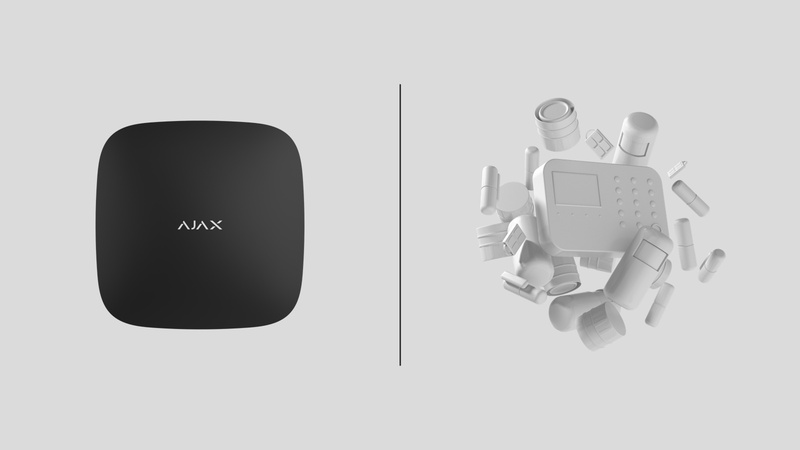 For communication between the hub and the devices, the Ajax security system uses Jeweller radio technology. It operates in the range from 868.0 to 868.6 MHz or 868.7 to 869.2 MHz (depending on the region) and constantly checks the noise level in the radio channel. As soon as the noise exceeds the limit value, the hub detects jamming, switches to a less noise-contaminated frequency, and sends appropriate notifications to the user and the security company. Jeweller communicates alarms within less than 0.15 seconds, automatically adjusts the signal strength while saving the device battery charge, and ensures a communication range of up to 2,000 meters. The communication between the security system devices may be unilateral or bilateral. In the former case, the detectors communicate alarms and system events to the control panel, while the control panel does not communicate with the detectors. If the device fails (due to sabotage or equipment failure) or the connection is interrupted, the control panel will not be aware of the situation. Both the user and the security company will not be informed of the security breach. In the security systems featuring two-sided connection, the control panel and the detectors exchange information. The detector keeps transmitting the alarm until the control panel confirms its reception. In this case, there is no risk of losing the data during a short interruption of connection. The control panel can change device settings and poll the devices checking the connection and the statuses. The reliability level of such a system is several-fold higher. The detectors send status reports to the hub every 12 or more seconds. The hub responds to the detectors notifying of the reception of the report and updates the device statuses in the application. 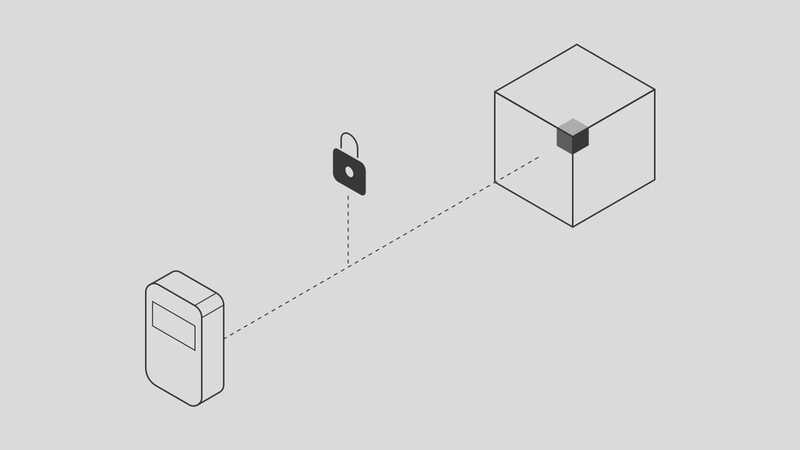 If the device does not respond for whatever reason, the hub considers the device to have been lost and informs the users and the security company of the situation. Upon sending of an alarm, the detector requests confirmation from the hub. If the detector does not receive a response, it keeps communicating the alarm until the hub accepts and processes it. 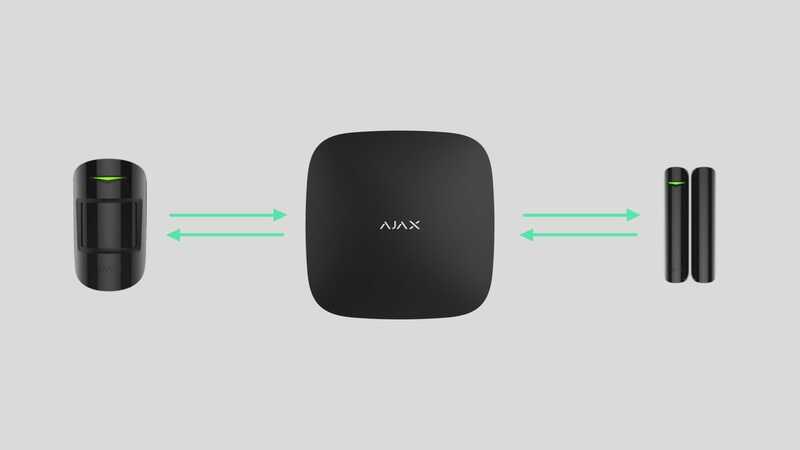 The two-sided connection enables the user to test devices remotely and change their settings through the Ajax apps: sensor sensitivity, loudness of sirens and their response to alarms, belonging to security groups, etc. The data transmitted between the detectors and the control panel should be encrypted and protected from fraud. The latter enables to avoid overriding of the equipment, including overriding of the key fob used for controlling security modes as the worst case scenario, since the perpetrators will gain complete control over the security system. 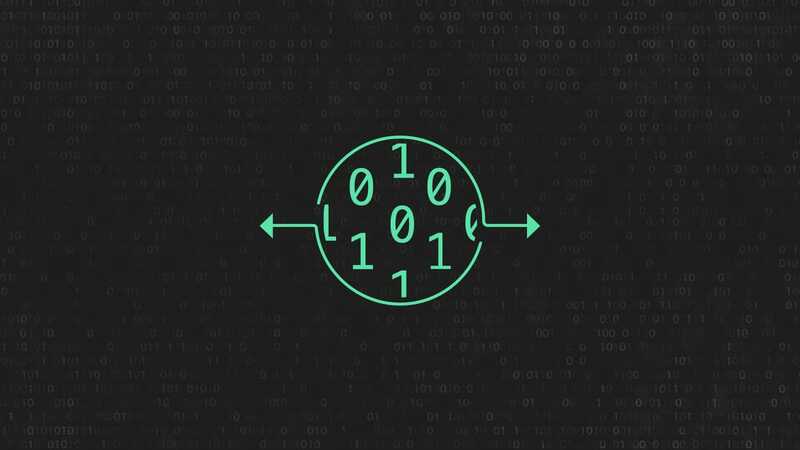 It is most optimal if the radio signal is encrypted with a complex algorithm, as the more primitive the encryption is, the easier it is to hack the system and gain access to its administration. For example, cracking a 128-bit AES encryption requires hundreds of years, and an alarm system with old or primitive encryption can be accessed with a code grabber within minutes. 👆🏻A code grabber is a device for intercepting signals between a security system and a controlling device (a key fob, a keyboard), which enables the hacking of the security system. Instead of standard algorithms and solutions, we use our proprietary solutions. 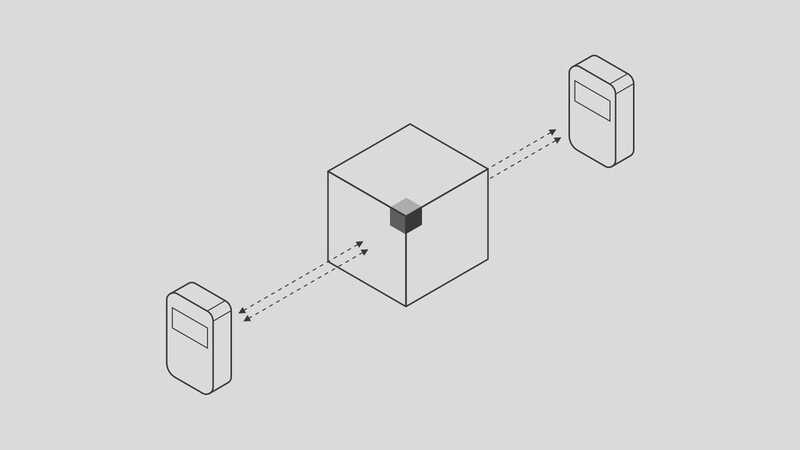 All transmitted data are encrypted with the AES algorithm featuring a floating key. 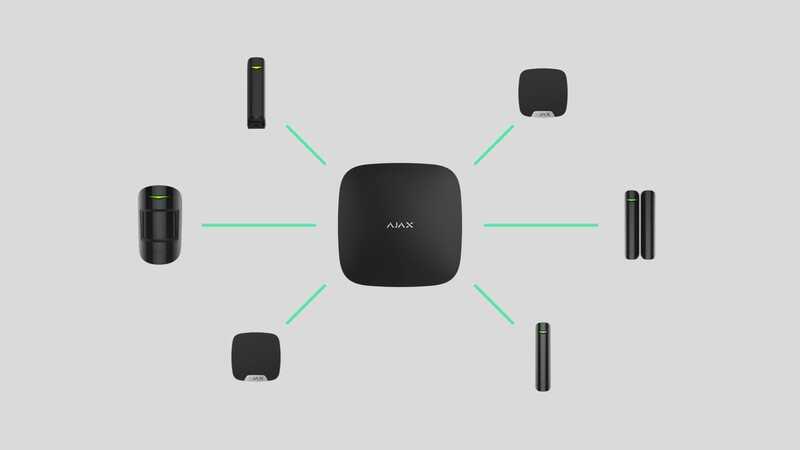 Each Ajax device has an individual identifier, and the Jeweller protocol provides a system of properties and markers for identification of its devices. The security system cannot be disarmed with a key fob that is not linked to the hub. The reliability of Ajax is confirmed with EN 50131 certification, and the security system devices are assigned Grade 2 integrity level, i. e. they are ready to counteract experienced attackers with special equipment. The task of the security system is to identify the threat as early as possible. However, being aware of the problem is insufficient — you need to respond to it correctly. Having received a message from the alarm system, the person can contact the police himself/herself (independent dealing with criminals is not the best idea). However, it is more rational to entrust the response to professionals by connecting the security system to the monitoring station of the security company. 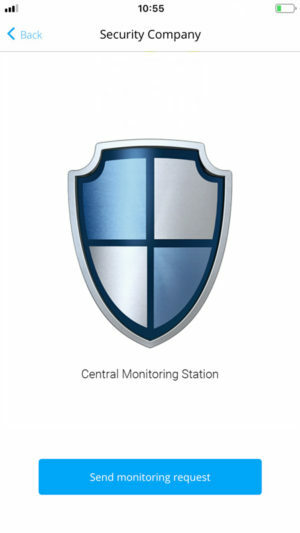 Security organizations link only certified security systems to their monitoring stations. During the certification process, the security equipment is tested by independent laboratories licensed to carry out specific tests: functional ones, equipment resistance to climatic and mechanical interferences as well as external electromagnetic fields, quality of radio communication, and the proneness of the device to external influences. If you fail at least one test, you will not receive a specialized certificate. Before new equipment is used under real-life conditions, security companies install the devices inside test facilities (apartments, houses, offices) alongside with the already proven security systems. If the new system is comparable in terms of reliability, i. e. is not prone to false triggering, disruptions, and detects threats correctly, then it is linked to the monitoring stations. Select the company from the list and click Send Monitoring Request. Only a reliable professional security system that provides comprehensive protection and ensures your awareness about the situation at the facility can be entrusted with the protection of people and property. The security system is always in touch with the outside world thanks to several communication channels. The user and the security company are aware of the normal operation of the security system as the cloud server regularly exchanges information with the equipment at the facility. 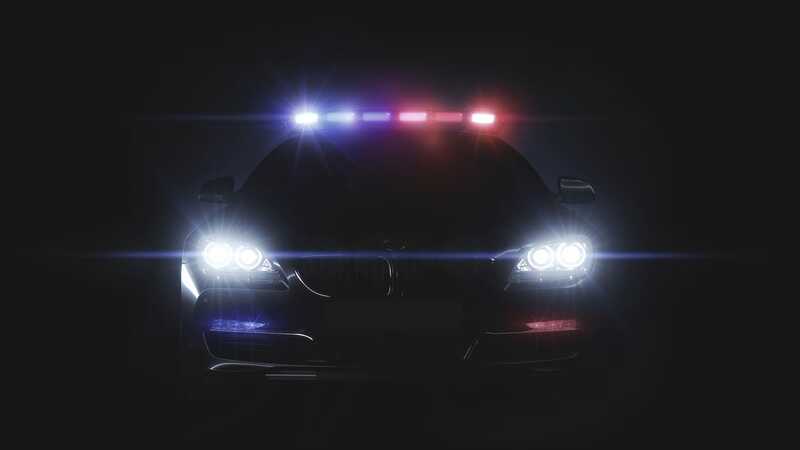 Detectors, controlling devices, and sirens are always linked to the central unit (control panel) as the security system uses the correct communication technology. In the case of equipment failure or sabotage, the control panel is notified of the problem and you and the security company will be informed of the situation. Intruders will not gain access to your security system and will not be able to disable or weaken the protection as the possibility of hacking and fraud is excluded. If an incident occurs, the security company rapid response team will arrive at the facility within minutes. Subscribe to our emails about secure life. No spam. We provide access to the Enterprise API to large security and service companies already serving or planning to serve thousands of Ajax security systems. Thank you! We have received your application.